Losing a child, no matter what their age, is a grief no parent should have to go through. David Maynard saw it firsthand with his sister Diane as his niece/goddaughter Deb (age 36) and her stepbrother Dan (age 41) succumbed to State IV brain cancer. Maynard and his sister used this tragedy to help other families with children afflicted with cancer by hosting an annual golf tournament. Nine years later, the tournament is still going strong. 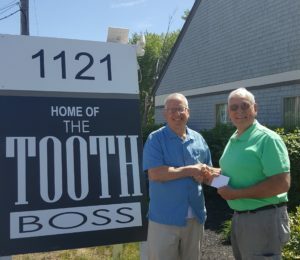 For this, David Maynard has been named the recipient of The Smiling Neighbor award given by South Weymouth Dentist Dr. Richard Wolfert, DMD. The Danny/Deb Golf Outing, held annually in June, raises money for the Devin Laubi Foundation, which provides financial assistance to families of children with cancer. Founded in 2004, the Foundation has helped many families in southeastern Massachusetts, throughout New England and across the United States. The outing will take place on Monday, June 25 at the Crestwood Country Club, 90 Wheeler Street in Rehoboth, Mass. The golf portion of the event begins at 1pm; the silent auction and dinner are held later in the day. Retired, Maynard resides in Brockton, Massachusetts with his wife Rita. The couple has three grown children and 10 grandchildren. In addition to his work on the Danny/Deb Golf Outing, Maynard is an active volunteer at Christ the King Church in Brockton. He was a founding member of one scholarship fund and founder of a second scholarship fund to help children from the parish further their education. For being selected as the Smiling Neighbor, Maynard had the choice of receiving a $50 gift card to Stockholders or a Sonicare Easy Clean model. He chose the Stockholders gift card, which will be included as part of the raffle or silent auction at the Danny Deb Golf Outing. People interested in participating in the Danny/Deb Golf Outing, either the golf portion or attending the silent auction and dinner can reach out to Maynard directly at dmay1015@aol.com or go to their Facebook page at https://www.facebook.com/bensnanny2/ for more information and entry form. More golfers and diners are still needed. The Smiling Neighbor award is given out on a quarterly basis to citizens of Weymouth going above and beyond the call of duty for their fellow citizens. People can nominate a Smiling Neighbor by sending an e-mail of 200 words or less to toothboss1@aol.com. Please remember to include your name and telephone number as well as the name and telephone number or e-mail of the person they are nominating. Nominations can also be sent to The Toothboss, 1121 Main Street, South Weymouth, MA 02190. For more information on The Toothboss, visit Dr. Wolfert’s website at www.toothboss.com or call 781-335-0604 to schedule a consultation.